The Garden was originally created with the help of many community volunteers, who throughout the years have continued to lend their support and expertise. 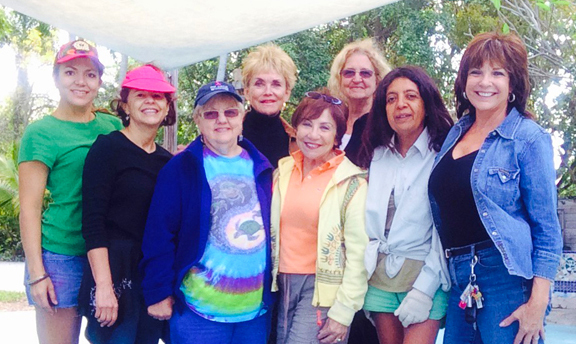 The Garden Club of Fort Lauderdale has been maintaining the garden since its inception. The entire Fort Lauderdale Club works here. All of the Club Circles and Members at Large (MAL's) take turns in maintaining the garden during the year to provide care through weeding, fertilization or replanting. 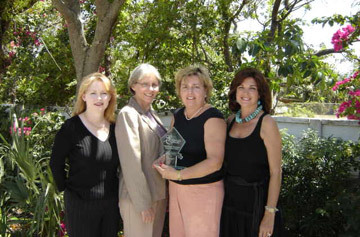 left to right are: Dr. Suzie King, Lighthouse Board President; Elly du Pré, Lighthouse Director; Sandy Lynch, Fort Lauderdale Garden Club President; and Rose Bechard Butman FLGC Civic Improvement Chairman. 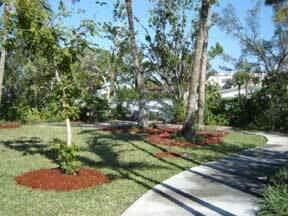 In 2006, the Fort Lauderdale Garden Club WON an Emerald Award, Broward County's highest Environmental Award. 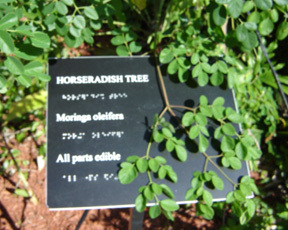 The club introduced Braille signage, the herb garden and the ceramic wall as well as many other plants and features to enhance the original concept. The Club involves youth whenever they get the chance to encourage their understanding of plant care and the pleasure plants can bring to everyone! The Lighthouse of Broward's mission is to enhance the independence, productivity and quality of life of blind and visually impaired children and adults. The Lighthouse was formed in 1973 by a group of blind persons, volunteers and professionals. The Lighthouse has grown from a small agency created to provide social support and recreational activities for blind people to a full service educational and rehabilitation agency. 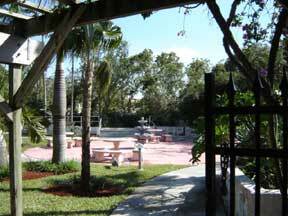 The Lighthouse serves as a focal point for the blind community in Broward County. They are the second largest facility in Florida in terms of providing services to elderly blind clients. Because Broward has a large elderly population, we have one of the highest incidences of visual impairment in the nation. It is estimated that there are over 32,000 severely visually impaired people in our community. We provide direct client services to over 400 people each week and we are the only source for comprehensive rehabilitation training for blind adults in Broward County. Children's services include an early intervention program for babies and young children and a summer camp and after school program for school age children. At the Lighthouse of Broward , every person with vision loss is encouraged to be as independent as possible. Beginning with the "basics" and moving on to include the most sophisticated adaptive skills and techniques, Lighthouse classes help visually impaired people address many of the unique challenges they face. The goal of every Lighthouse program is to help the person with vision loss to achieve his or her full potential in the community. The Lighthouse of Broward is fully accredited by the National Accreditation Council for Agencies Serving the Blind and Visually Handicapped (NAC), and is a member of the Florida Association of Agencies Serving the Blind and a United Way agency.